Well we didn’t make it easy for ourselves. Playing over 45 minutes against 10 men and failing to net the crucial second goal to kill the game, it was a nerve-racking end which finally saw Bradford City all but secure safety and League One football next season. I had been fortunate in that my last two City games were fantastic away victories at Colchester and Leyton Orient respectively; and yet I had heard about the two, what some called ‘horror’ shows at home against Walsall and Oldham. With Peterborough fighting to ensure of that last play off spot and being the form team, taking 12 points from the last 15, I didn’t expect an easy game at Valley Parade for City. With other teams below us picking up points earlier in the day, anything but a defeat would have sufficed in my opinion. City started with two changes from the team that drew with Rotherham a week ago. In came the fit-again James Hanson and, more surprisingly, the forgotten man Rafa De Vita, replacing Kyle Bennett and Matty Dolan respectively. I had to take a second look at that team sheet believing that De Vita could get the nod above both Bennett and Thompson, but with contracts to play for, De Vita had a point to prove in only his 17th league appearance this term. Both teams opted for a 4-4-2 formation and the opening of the game started with direct styles using the long ball to the target man to hold up and bring others into play – Hanson for City and Britt Assombalonga for Peterborough. With 21 goals to his name as the league’s second top scorer, the City defence certainly had to keep him quiet. As the game settled down and the teams began to play it on the floor, Peterborough had the best opening chance. A nice passage of attacking play with a flicked ball inside from winger/striker Nick Ajose saw midfielder Tommy Rowe strike a shot just wide of Jon McLaughlin’s post. City then started to come into the game, with the effective defensive pressing of Hanson and Jon Stead forcing the early ball and errors from the Peterborough defence. Adam Drury was providing good support to the attack on the left hand side and it was his long throw which resulted in City’s first real chance – the throw coming to Gary Jones, whose looping volley went just over the bar. De Vita followed this up with another chance a few moments later with a wonderful, fizzed low ball across the box which the sliding Hanson failed to connect with. It was crucial that Drury was providing support on the left as Adam Reach was given a free role, switching across the midfield but mainly slotting in behind the front two. The Peterborough defence were struggling to pick him up and Reach was getting the space to run into the key attacking areas. It was one of these runs that resulted in City getting the game’s only goal, as Reach drew a foul from the Peterborough defence midway through the first half and picked himself up to wonderfully float a 30 yard free kick into the keeper’s top left corner. 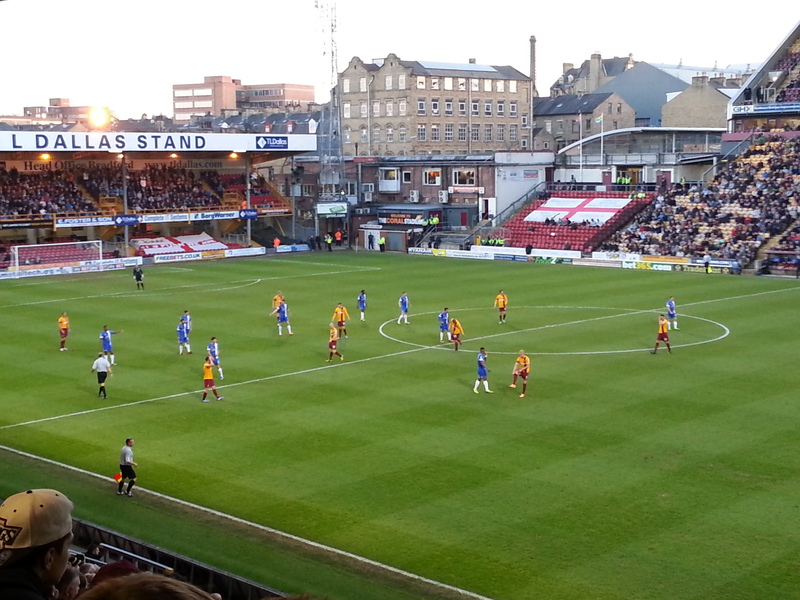 This notably gave City a confidence boost and increased the volume level of the faithful inside Valley Parade. It also gave Peterborough the impetus to force an equaliser, and the right wing threat of Ajose and Mark Little were keeping the City defence busy. It was then the turn of Peterborough to shoot themselves in the foot with the sending off of defender Sean Brisley for two virtually identical yellow card challenges inside the City half within two minutes. You couldn’t argue with the bookings, as first Stead and then Reach had turned the Posh defender and were away before contact was made. You can say they were stupid challenges, but arguably in the heat of the game situation, it seemed as though Brisley felt like he had to make the challenges to prevent the City attack. Going into half time, it felt as though City now had the momentum to dominate and kill the game against the 10 men. The second half was quite a different story though as Peterborough came out all fired up with more attacking promise and it became a more entertaining contest, with both teams pressing for the next goal. It was United who had the best chance with Assombalonga receiving a slide through ball breaking free from Drury, but his cross into the box was well cut out by Stephen Darby and scrambled up by McLaughlin. Peterborough continued to press and with the last 25 minutes to go, City made two like-for-like changes to freshen up the attack with Aaron Mclean, back against his old club, replacing Stead and Kyle Bennett on for De Vita. Bennett almost made an immediate impact a few moments later with a surging run down the right and a beautifully floated ball to Hanson who failed to connect strongly to put the header towards goal. It was then the turn of the other sub, Mclean, to slip in Reach on the left, who forced the keeper into a save with a low shot towards the near post. As effective as Reach was in the first half, the left midfield still felt unbalanced in this period with Hanson often moving out of position and drifting wide to balance the play. With these second half substitutions and Reach returning back to the left wing, the team had more shape and Jones and Nathan Doyle were controlling the midfield area, as City began to edge the possession and offensive play. City should have wrapped up the points with arguably the half’s best chance. It was Reach who floated a ball through the centre and Bennett unfortunately headed straight at the keeper, when an inch or two either side would probably have resulted in the killer second goal. 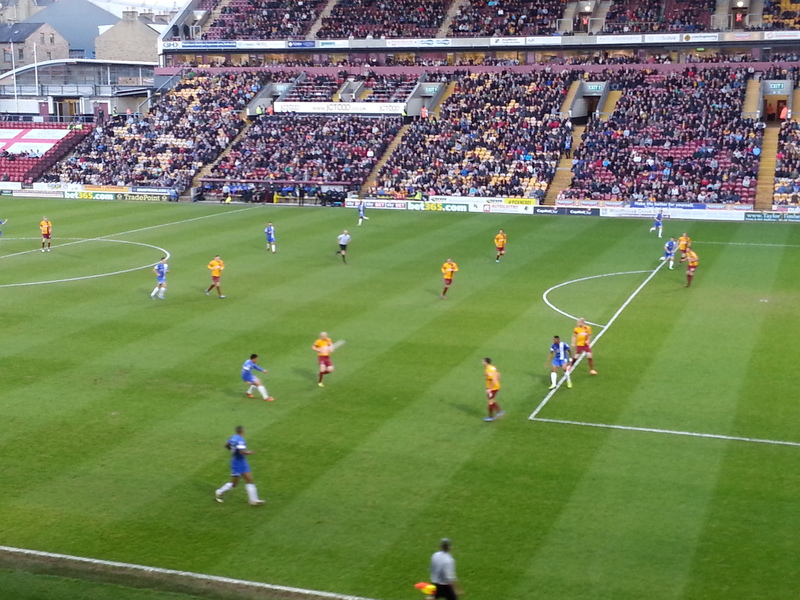 It was Peterborough through who provided a nervy last 10 minutes or so, as City were keen to sit back and were not helped by some defensive uncertainty: notably one misplaced, suicidal ball across the back line from Rory McArdle, forcing the pressure on the Bantams. It was not a poor defensive performance by any means, but the odd loose pass and, at times, slow passing to move the ball into the midfield, were not helping matters. Peterborough pressed for a last gasp equaliser with a flurry of late desperate corners in which even the keeper came up, but it was not to be. A gritty, solid if unspectacular, team performance had heralded a much needed three points to ensure breathing space between City and the lower placed teams. It’s not mathematically safe yet, but barring an extraordinary and a frankly ridiculous set of results it will thankfully be League One football for Bradford City next season. We are mathematically safe in that Notts co, Stevenage and Shrewsbury can only get 52 points and Crewe play Colchester on Easter Monday so whoever loses can also only get 52 points and if they draw our goal difference is so superior that we are safe anyway. As regards the game I disagree with the report that it was a solid but unspectacular performance as I thought the 1st half we played our best football of the season with our 4 3 1 2 formation with numerous chances. The 2nd half we went back to 442 and then it was as you say more grit than skill, but still created the better chances to kill the game off. All in all a great win against a good team. Yeah I agree with the first comment, City started with 4-3-1-2, Reach in a withdrawn CF position (Messi esq!?!) and Hanson and Stead pushed on. Peterborough Couldn’t handle that as they thought we would line up 4-4-2. I thought that the three midfield players (Jones, Doyle and De vita) played very well in the first in breaking up the play and moving the ball forward quickly. 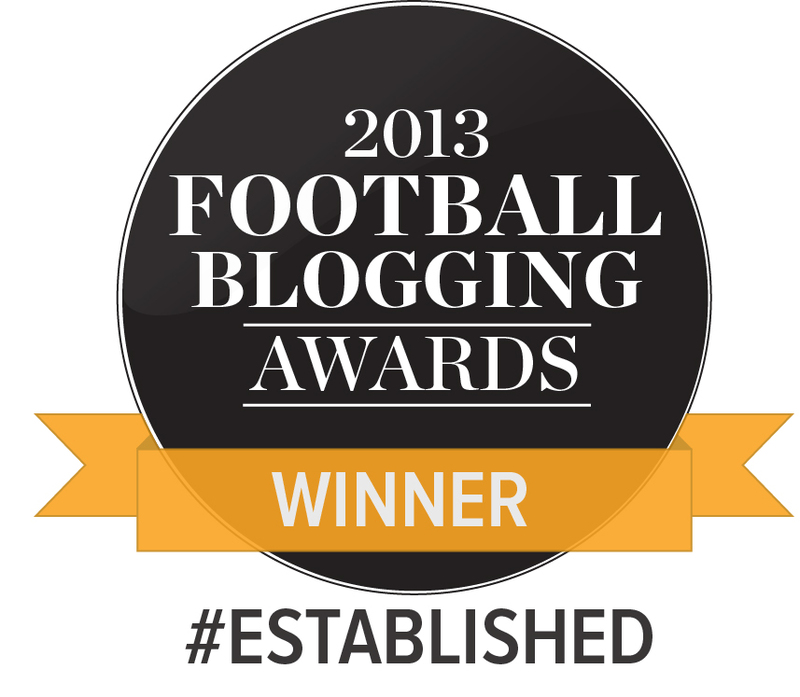 Although the downside was is that Hanson and Stead also had to provide a little width (sadly their aren’t blessed with Kyle Reid’s pace, Hanson tried to outpace a centre back once and was left a little red faced when he was beaten to the ball) but the downsides were outweighed I felt by the positives. Reach, De Vita, Doyle were my star performers.